Nature lovers visiting Germany's Bavarian Forest National Park are in for a treat. 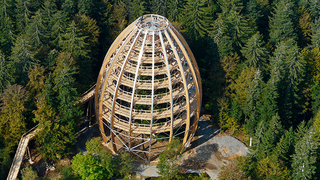 At a height of 145 feet (44 meters), the brand new egg-shaped observatory offers visitors an unprecedented view of the surrounding area. And with its 4,265 feet (1,300 meters) of walkways and innovative open concept design, visitors can view their surroundings in a way that's practically borderless. Located near the city of Neuschönau, Germany, the Tree Top Walk is situated in a pristine area of the Bavarian forest where the Lusen and Rachel mountains are within sight - and on a clear day it's said that even the Alps are visible. The spiraling tower is built around three massive fir trees. The walk is completely safe and accessible for wheelchairs and children's buggies. The walkways don't rise more than 6% to provide a smooth and controlled ascent. A wooden fence and transparent net allow visitors to interact with nature in an almost seamless way. The Tree Top Walk features three stations with wooden bridges, rope bridges, and other challenges. Along the extensive walkways, nature lovers can check out an array of wildlife, including mosses, insects, small animals, and birds. All images via National Park Bayerischer Wald. H/t EcoChunk.